Last weekend was busy. Not only was it Mother's Day, but also my Dad's birthday. Basically, it was a weekend destined for good dessert. What's better for a duel Mother's Day/Dad's Birthday weekend than a strawberry cheesecake? Nothing. Well, actually there are tons of delicious things to eat when celebrating, but in my family cheesecake is kind of the tops. One issue, I didn't have a recipe for one. So instead of buying one like a normal person, I experimented by creating my own. It took a few tries, but I'm really proud of this one. It's creamy + nutty + fruity. 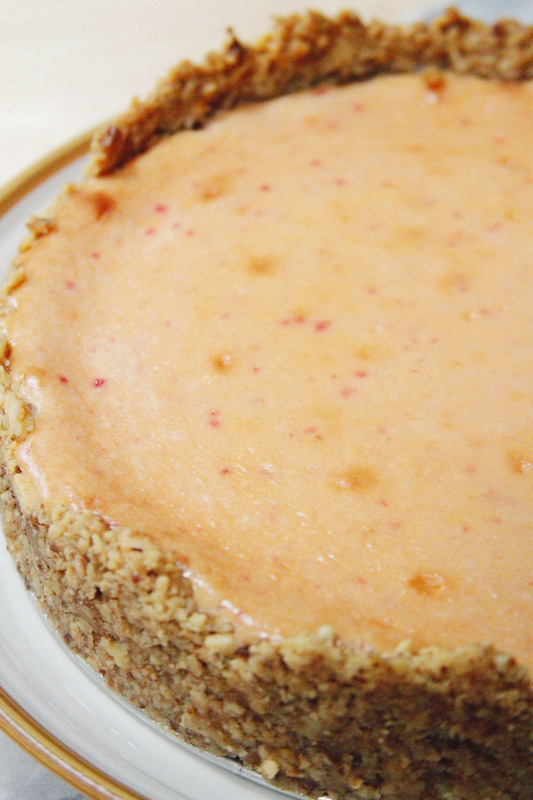 It's just like a classic cheesecake, but there's a nut crust which takes it up a notch. Also there's a secret ingredient that makes the cheesecake slightly pink. Scroll down for the recipe to see what it is! 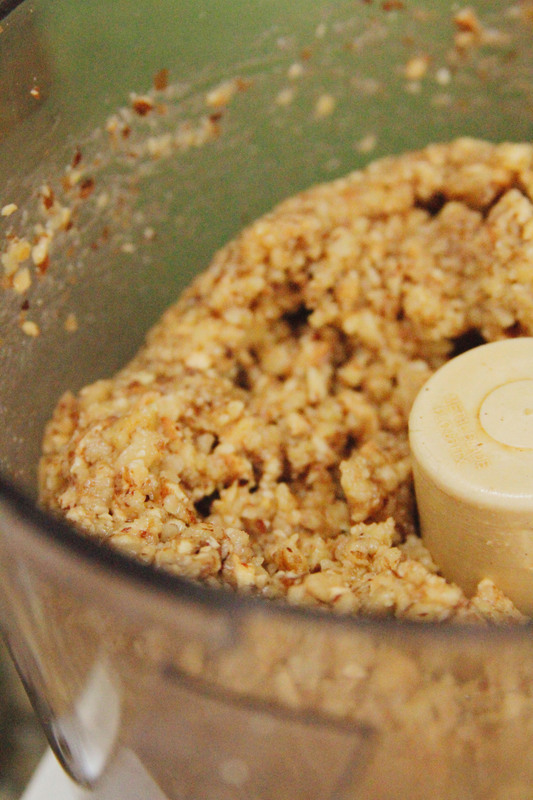 In a food processor combine the walnuts, hazelnuts, butter + maple syrup. Pulse until the mixture forms a moist crumb. Add the crumbs to a springform pan + press them firmly into the base + up the sides of the pan. You might want to wrap the pan in tinfoil to prevent any leakage. Clean your food processor (unless you have two, I'm jealous) to make the filling. Add the cream cheese + the beet. Pulse to combine, making sure the beet gets combined. Add the sugar + vanilla extract + continue pulsing. Add each egg one at a time, pulsing in between each. Add the filling to the crust + bake in the oven for an hour and twenty minutes, or until firm in the center. While the cheesecake is baking, prepare the whipped cream by beating the heavy cream + white sugar in a bowl until whipped. 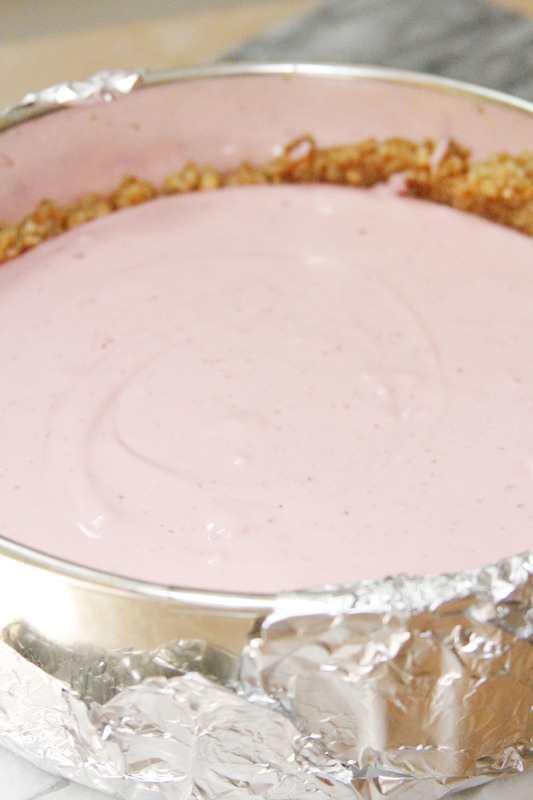 Once the cheesecake is done, remove from the oven + allow it to cool in the fridge. Before serving, top the cheesecake with the whipped cream + strawberries.